The Parramore Healthy Community Coalition will spearhead initiatives ranging from nutrition education to diabetes screenings for the community. 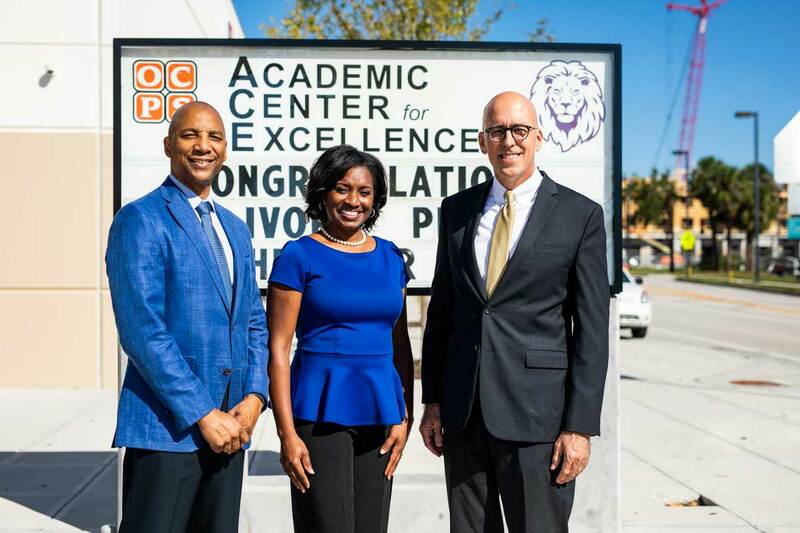 From left to right: Tony Jenkins, Florida Blue’s Central Florida market president; Shannon Currie, OCPS Academic Center for Excellence community partnership school director; Thad Seymour Jr., UCF vice president for partnerships and Chief Innovation Officer. Healthy lifestyles enable individuals to live full, productive lives. It allows children to maximize their growth and learning potential. It enables parents to excel at their careers and pass along positive behaviors to their children. It creates a community where physical, emotional and mental well-being is a central focus. UCF has established the Parramore Healthy Community Coalition, which is focused on creating a healthy community model that encompasses individual health, civic health and community health, thanks to a $600,000 grant from the Florida Blue Foundation. UCF has partnered with the Orange County Public Schools Academic Center for Excellence, a Community Partnership School and several community agencies and organizations to enhance its outreach capabilities in the community. Events and programming aimed at improving health in the community are currently underway by a multidisciplinary team led by UCF’s College of Nursing. “As we think about the health of this community in the years ahead, we couldn’t have a better partner than Florida Blue, who shares our vision for creating healthier, happier, more vibrant communities,” says UCF’s vice president for partnerships and Chief Innovation Officer Thad Seymour Jr.
Children at the Boys & Girls Clubs of Central Florida Levy Hughes Clubhouse are learning about healthy eating from UCF nursing students. Blenders and other kitchen supplies were provided to the club to help encourage healthy meals that incorporate fresh fruits, vegetables and lean protein. Children at the club receive nutrition education and hands-on cooking demonstrations, including how to make smoothies. Teachers at OCPS-ACE receive counseling on stress management, healthy eating, weight management, hypertension and diabetes screenings, and education at monthly gatherings. Nursing students are also providing diabetes education to patients at Shepherd’s Hope, a volunteer organization that provides healthcare for the uninsured. During hurricane season, more than 100 hurricane kits were made and distributed to patients, which included first-aid kits, flashlights, hand sanitizer and other items. In addition to teaching health education and providing tools to students, teachers and the community, the coalition will also move to identify community needs working with multiple partners. There are also plans to revitalize the OCPS-ACE community garden in partnership with Fleet Farming, assess behavioral health needs for students, and provide nursing interventions in the community. UCF Downtown, the university’s new campus currently under construction in downtown Orlando, is being built within the Parramore footprint and is adjacent to OCPS-ACE. Construction of the campus, which will be shared with Valencia College when it opens this fall 2019, has spurred the university, college and partners to step in and assist Parramore in rebuilding a healthy, vibrant community.